Some famous historic cafés grace the beautiful Boulevard St-Germain. A short stretch along the Boulevard Saint-Germain (6th arrondissement) is home to some famous names from the literary history of Paris. 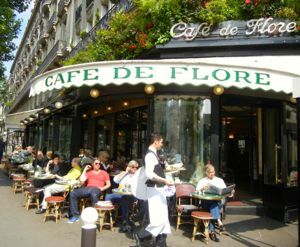 Since the 1880s, the Café de Flore has been a preferred locale for writers and artists, including Guillaume Apollinaire, Oscar Wilde, André Malraux, and Jean-Paul Sartre and Simone de Beauvoir. At all of these locations, waiters clad in black pants, white shirts, black vests, and long white aprons help preserve the historic atmosphere. You can visit any of these cafés today and enjoy a coffee, a beer, or a meal. You'll pay the price for the excellent service and romantic memories, but you're not likely to run into a modern Ernest Hemingway or André Gide. Today's Boulevard St-Germain has lots of other cafés and restaurants, serving both locals and visitors. They range from small, modest places to the Léon de Bruxelles chain, which features moules frites (mussels and French fries). from Café de Flore, Paris. 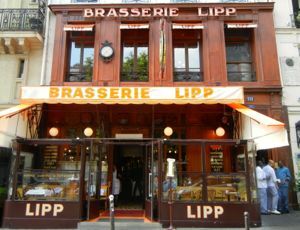 Also nearby is the Marché St-Germain—St-Sulpice area, with a great selection of restaurants. 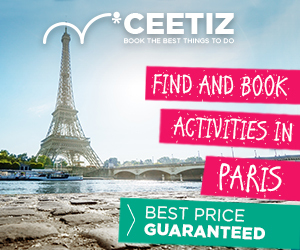 And if you're looking for less expensive fare, try Rue St-André des Arts, Rue de Buci, or the little streets near Place St-Michel. Above, Café de Flore, on the Blvd St-Germain, Paris.